Once upon a time in Chocolate Land…..
Once upon a time in a far off land. There lived two bad tempered chocolatiers who try as they might just couldn’t seem to get the hang of tempering chocolate. 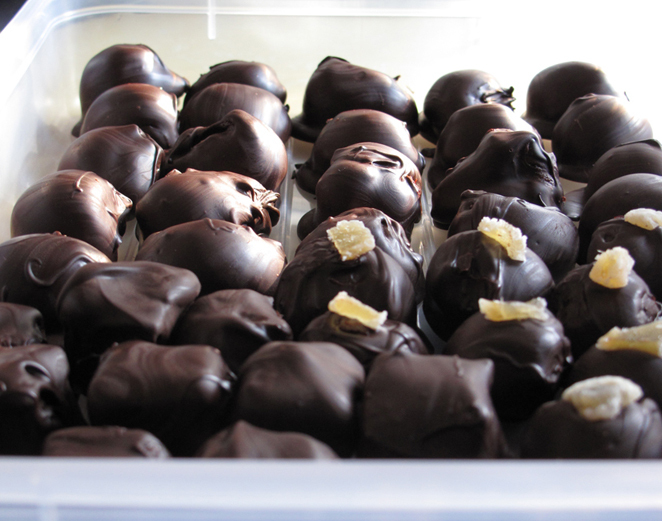 The first chocolatier had a go at making chocolates for Christmas one year. Lovingly done, creatively produced, and beautifully presented. But little did she know that chocolate wasn’t meant to be just re-melted and added ingredients to if you wanted a consumable product. How they all laughed when her proud presentation of chocolate was unwrapped and before her very eyes the chocolate turned to powder. You see ‘temper’ wasn’t a word that was heard of much in their Kingdom of Chocolate. Despite mass consumption of it. That was a lesson learnt very quickly by Chocolatier 1. Then came along chocolatier 2. In his fancy apron, wild ambition, and chocolate making course voucher he spent a lovely afternoon learning from the best. How proud he was as he brought home the glossy, beautifully tempered chocolates. Tasting of honesty, truth and happiness, the two chocolatiers vowed that between the two of them that they would conquer the chocolate tempering dragon. Owning it, as they rightfully thought they should be. Just at that sorrowful point when they were thinking a tempering machine via the surrounding kingdom of E-bay was sounding pretty enticing, a hand reached out…. A hand of an angel. The hand of Matcha Chocolate. She had heard their whispered tones of disappointment, their various comments of rue and decided that she would help the little ones. Help them with a long instruction list. Throwing caution to the wind they embarked again. They eyed off the instructions, and chocolate bowls at the same time. They closed their eyes, crossed their fingers and dipped them in… streaky. Streaky chocolate. Which could only mean one thing, untempered. They seemed so close. There was the snap, it tasted good, the flavours were working, but still it came down to the tell all streak. Sighing between themselves. They shook their heads, and silently packed away their tools. With whispers of another day… maybe we are only meant for consumption and not production? They took consolation in the loving arms of Whittakers. They knew there would be another day for a rematch, but who knew when that day would be? One hundred years passed in the Land of Chocolate, and Chocolatier 1 was getting a little anxious. She still felt the weight of not being able to make tempered chocolate. Wringing her hands together, she whispered to Chocolatier 2 that she thought tonight was the night, tonight was the night they would redeem themselves…hopefully. They side tracked the elves, and got busy. With Matcha Chocolate’s instructions firm in hand again they commenced. It was a full 5 degrees warmer in the little kitchen then the last few times they had tried. Thinking that this could well have been the downfall of them last time, they were hopeful. With bowls full, spoons stirring and molds awaiting. They worked through the night. The elves grew tired and took themselves to bed, the Chocolatiers worked on. With chocolate drying on every surface, as the sun rose and spread it’s sunny fingers over the land, a bleary eyed Chocolatier stumbled to the kitchen. Before her lay a chocolate. Chocolate that looked glossy, had a snap, and not a streak to be seen. Sure it was a little sloppy looking but the Chocolatier had given up trying to be dainty with the last lot of chocolate coated truffles they had made many moons ago. They had tempered! Hooray! With a spring in their Chocolatier boots and a quick wipe of their dirty chocolatey mouths, they hi-fived themselves…and they lived happily ever after. 1/ Picture one is of properly tempered chai slab. 2/ Assorted ‘streaky’ truffles. Chai, Rum and Raisin, Chilli, Orange flavours. 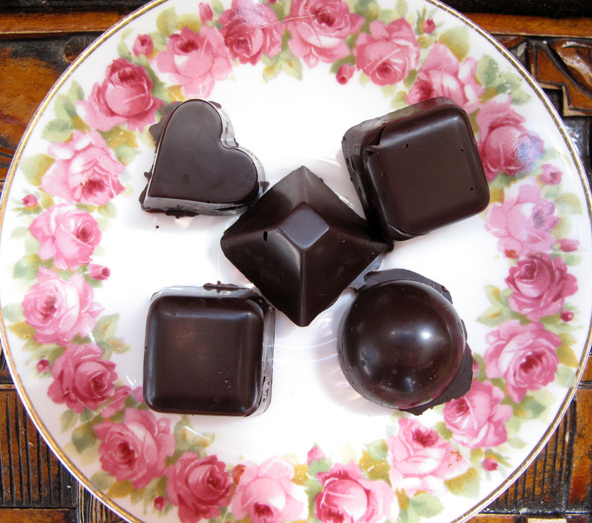 This entry was posted in Food Glorious Food and tagged chai, chocolate, hand made chocolate, orange, rose apple, tempering, truffles, untempered chocolate by cityhippyfarmgirl. Bookmark the permalink. It took a while Celia, but we got there! Now you’re just showing off! Smarty pants! Nah, if I was showing off they would be perfect. I’m just sighing with relief that we did it. Took long enough! Beautiful little chocolates too, well done. Thanks Anna. I’m glad we finally got that one licked too! Such dedication and persistence deserves the rich pay-off. I, for one, and completley sure that I was made for consumption, not production! I think we are mass consumption and small production… it’s just so good when you are doing it yourself as you are completely catering to your own tastes. seriously, when do you sleep. especially if you have littles the same age as mine. ps. quinn is five and tate will turn three in a few weeks. Little Monkey is 2 and 2 months and Monkey Boy is 2 months short of 5, so similar aged little fellas. Everything looks fantastic. I am so pleased to see it has worked for you and looking forward to seeing what other chocolate creations you come up with. Your Chai truffles are just fab. I make a Masala Chai moulded chocolate that I have put in each of my last three selection boxes. I also use chai tea to make caramel as well- lovely. Thanks so much for trying the technique out. Katie all thanks to you! 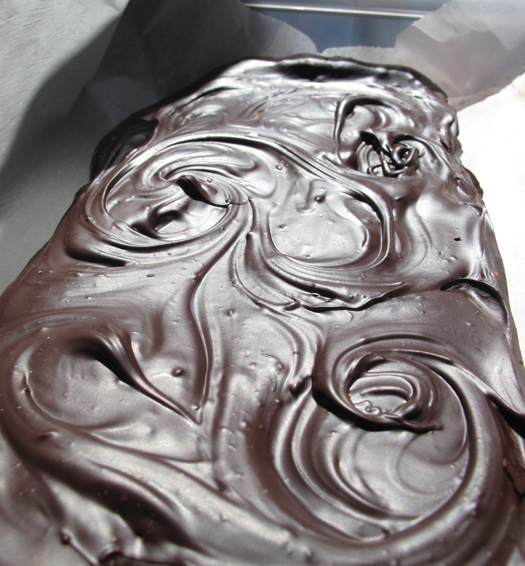 Your tempering instructions and your chocolates for inspiration….and chai caramel, sounds too good to be true. It’s fun thinking of all the different kinds of concoctions we could come up with. That was awesome to read!! I don’t honestly how you did it, with the day-to-day chaos and then you tempered chocolate. You’re amazing. Very pleased Christine. I’ve looked at it everyday, admiring the fact there are no streaks, and no blooming…small things/small minds eh? You and Mr. Chocolate are so talented . Good job- on the chocolates and the story! Hopefully thats not the last time Heidi! I looked on Matcha’s website but couldn’t see instructions on how to temper, lots on making truffles, is that what you meant? I only tried this once, but would quite like to try again when I have some spare time to get down and chocolately in the kitchen. Down and chocolatey in the kitchen, that definitely describes making truffles! No tempering instructions on Matcha Chocolate’s site yet. She had been kind enough to get in contact with me after reading on Choclette’s site that my tempering skills were lacking. I believe she will be putting up the instructions on the blog at some time though. Wowsers, they’ve gone straight to my thighs as I look at them! Beautiful. So tell me, is ‘streaky’ just an aesthetic issue or does it mean the tempering won’t hold out and the chocs will crumble/discolour/otherwise shame you? PS on another note entirely, thanks for the congrats, I too wonder if we are insane given our two energetic, sleep-denying boy-children. What if we get another one?!! (Then again,the prospect of a girl terrifies me more, for some reason). Yes to both those streaky options Gina. If it’s just a little streaky like the picture of the chai truffle- still tasted delicious just aesthetically not right and if you left it for awhile it could ‘bloom’ and spread. When I did my first one, before I had heard of the word temper I went down the crumble/discolour and thoroughly shamed me route though. I looked at it and it crumbled to dust- and it was a gift. I was mortified! Learnt that lesson VERY quickly. Chocolate-LAND? WOW! I want to go to chocolate land right now! What an absolutely fab post – a lovely bedtime read! Congratulations on getting into Chocolate Land. I’m still running shy of trying this out and I do have Katie’s instructions and Celia’s and still feel daunted. BUT feeling most inspired that you’ve cracked it. Truffles all sound so delicious – are you going to give us the recipes? I was very very luck yesterday and received a box of Katie’s chai caramels in the post – I won them – yum yum delicioso, but I want to try yours too. Choclette you would be fine! I’m sure it was just us that was a little tempering challenged. The truffles were such a mix of flavours. 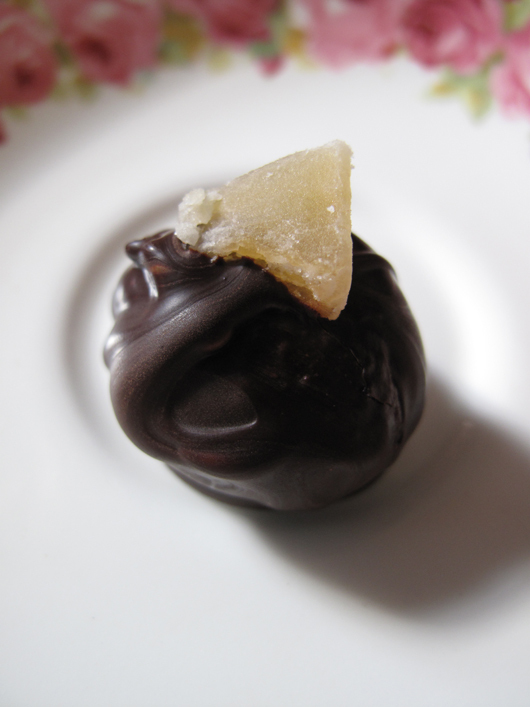 The original basic truffle recipe was from the Adventures with Chocolate- then we just played. So the chai was a dash of cardamom, cinnamon, nutmeg, with chunks of uncrystallized ginger. The Rose Apple jelly (i’d made that before) was popped into the middle of the moulded chocolate. The rum and raisin was a soaked overnight mixture, then drained off and added to the truffle mixture when still hot and the orange one…a mixture of lots of things I can’t remember (orange juice, orange rind, glucose, sugar, citric acid) the measurements. For that one we just kept playing with taste until it was right and then added it to the truffle when warm again. Then cooled and then dipped in the chocolate. Realistically, looking back on what I have just typed…I think we were a little over our heads. If we had started just with a simple chai slab it may have been easier. But I guess like Celia’s post at the moment, its all about taking risks and learning from them. Go girl, you can do it…and enjoy those chai caramels! Thanks for linking me back to this! I am seriously impressed with your efforts. My chocolate making to date is like your early attempts – melting chocolate, adding some bits, and putting it into molds. Mine hasn’t (I think!) fallen apart but it was never brilliant. Now I know why, and may indeed be motivated to take up the challenge!